A peace deal has been made between the Central African Republic government and 14 rebel groups after their first-ever direct dialogue aimed at ending years of conflict, the United Nations and the African Union announced on Saturday. "This is a great day for Central African Republic and all its people," said the AU commissioner for peace and security, Smail Chergui. The deal will "enable the Central African people to embark on a path of reconciliation, harmony and development," Chergui said, appealing to all citizens to support the agreement. 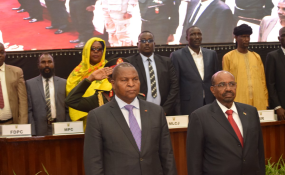 The agreement was signed at the end of a 10-day negotiation in Sudan's capital, Khartoum. As the talks began, the Norwegian Refugee Council warned of a "catastrophe" if no agreement was reached, saying repeated cycles of violence in one of the world's poorest nations had "pushed people's resistance to breaking point." The deal is a sign of hope that the impoverished, landlocked nation, where interreligious and intercommunal fighting has persisted since 2013, may come to a peaceful existence. Fighting began in 2013 when predominantly Muslim Seleka rebels seized power in the capital, Bangui, with mostly Christian anti-Balaka militias fighting back. The conflict has seen numerous mosques burned, priests and other religious leaders killed, and many Muslims have fled the country. At least two leading figures have been sent to the International Criminal Court in The Hague. A report by the UN children's agency last year said fighters often target civilians rather than each other, attacking health facilities and schools, mosques and churches and camps for displaced people. At least half of the more than 640,000 people displaced are children, it said, and thousands are thought to have joined the armed groups, often under pressure. The UN has also warned that the fighting carried a high risk of genocide. Fighting broke out in a number of towns across the country again in early 2017, following a period of relative calm in 2016. About 1.2 million people -- about a quarter of the population -- have now lost their homes due to the violence, according to the UN. After more than 40 people were killed in a rebel attack on a displaced persons camp in November last year, both the leader of the 13,000-strong UN peacekeeping mission and the country's prime minister acknowledged there had been shortcomings in the response. "I knew that we did not have all the necessary means to protect our people," Prime Minister Simplice Sarandji said at the time.